Pioneers in the industry, we offer acrylic based wall paint from India. Acrylic Based Wall Paint forms a film on the surface after drying to bridge small hairline cracks & to make waterproof to substrates. 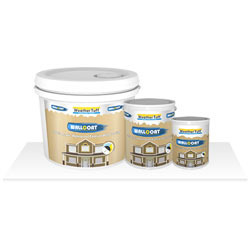 It is used in exterior walls, RCC surface, asbestos sheets, and slopping roof, brick walls. Apart from this, clients can get the coat from us at reasonable rates. Slopping Roof, Brick Walls etc. It's elongation & flexible property makes surface waterproof & uniform. Breathing property of dry film has a better permeability to stay long against internal wall moisture. Can be applied very effectively where cracks have already developed. Resistance to dirt pick-up on the surface. Excellent resistance to U.V. rays for outstanding durability. Can be tinted to any pastel shade with universal stainers. Due to smooth film & Anti fungus additives, it stops the growth of algae & fungus on the coated surface for longer period. Excellent protection against chloride, sulphate & water vapour penetration from atmosphere. Resistance to mild Acid, Alkali & Salt vapours. Clean the surface thoroughly with water & remove the flakes of old paints or lime wash. Dilute it with max 10% water and apply first coat on water wetted surface (wall) with brush or spray. If necessary, third coat should be applied for good opacity.